It's hard to know whether reading the book before seeing the movie/watching the TV series, or watching the film/TV show first before reading the book upon which it was based is best. As a general rule, I've found that reading the book before seeing the movie/watching the TV series is a good rule of thumb, but occasionally the reverse is true. And I wonder if we generally prefer whichever we experience first, whether through a sense of loyalty or simply the fact that whatever we saw or read first preempts the other in our minds. The difference in medium (written word or film) necessitates some changes, of course, with a wide range of fidelity to the original story and general quality of the outcome. I recently watched the first season of Miss Fisher's Murder Mysteries and enjoyed the feisty, independent titular character as portrayed by Essie Davis, as well as the appealing cast of supporting characters. The overarching backstory that gives shape to the entire season, and provides much of Phryne's motivation for solving crimes in the first place, involves the disappearance and death of her younger sister when they were children. Each episode starts with some dastardly crime being committed or discovered which Phryne, her friends, and the devoted police inspector solve by the end of the hour. It's not high art, the plots are not complex, but they are entertaining and interesting period pieces of Australia in the late 1920s. The first episode's plot follows the general outline of the inaugural Phryne Fisher book, Cocaine Blues, though with a few major changes. 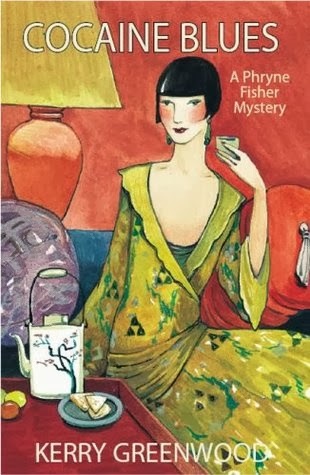 The murder that occurs in the TV episode is only attempted in the book, Phryne's relationship to the victim and his wife is much closer, and the police inspector plays a much larger role. None of these are unreasonable or insurmountable changes to make for a television show. However, Phryne's sister is revealed to have died of diphtheria and starvation, during her family's days of poverty before World War I eliminated the several people between them and a rich inheritance. This shifts Phryne's motivation significantly. The story becomes much more focused on class issues and wealth inequality than Phryne's quest for justice for her sister and all others who have been harmed. This is reinforced throughout the book through Phryne's observations, such as this one as she arrives at a lavish party. Phryne surveyed the iced-cake frontage of a huge house; the red carpet and the flowers and the army of attendants awaiting the guests; and cringed inwardly. All this display, while the working classes were pinched beyond bearing; it was not wise, or tasteful: it smacked of ostentatious wealth. The Europe from which Phryne had lately come was impoverished, even the nobility; and was keeping its head down, still shocked by the Russian revolution. It had become fashionable to make no display; understatement had become most stylish. Still, this shift in focus isn't bad, just different - very different - from the television series. Both are intriguing areas to explore and I think both can be enjoyed for what they are rather than by comparing them to the other unfavorably. But what I found most disconcerting were the changes to the personalities of some of the supporting characters. In the TV series, Dot, Phryne's personal maid, provides a conservative and "sweet" foil to Phryne's outlandish modern woman personae. In the book, she's just kind of dull and low-class. Likewise, Phryne's two assistants, Cec and Bert, are two-dimensional anti-capitalist almost-indistinguishable-from-each-other "Reds" on the written page (which fits in well with the class warfare focus of the book), but are far more distinct and complement each other much better on the screen. All in all, I'd have to say that the television series wins this round, though I'm not quite ready to give up on the books yet. So we'll see how the second book in the series plans out.